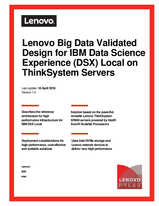 This document describes the reference architecture for the Lenovo Big Data Validated Design for IBM Data Science Experience (DSX) Local with ThinkSystem Servers. It provides a predefined and optimized hardware infrastructure for high performance implementation of IBM DSX Local software. This reference architecture provides planning, design considerations, and best practices for implementing IBM DSX Local with Lenovo and Intel products. With ever increasing amounts of data being made available to an enterprise, the challenge of deriving the most value from it has become very important. This task requires the use of suitable analytics software running on a tuned hardware platform. Running DSX Local for machine learning use cases as well as incorporating it alongside Data Lakes are areas of significant interest and focus. The IBM DSX Local solution described in this document is very well suited for implementing the infrastructure to support these modern analytics initiatives. To view the document, click the Download PDF button.